Winter Wx Advisories have been hoisted for the overnight hours from 3AM - 5PM tomorrow for about a tenth of an inch of freezing rain and minor sleet accumulation. 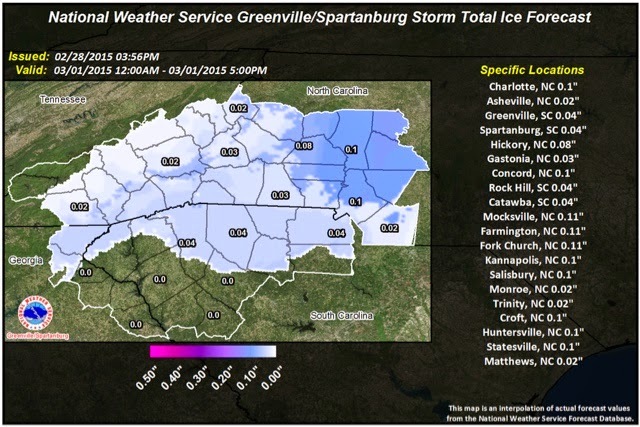 Davie and Rowan counties under WWA's - either the same or Freezing Rain Advisories out for the majority of NC. Only difference being the NWS thinks it is possible some sleet/snow mixes in at the beginning in WWA counties and just freezing rain in others - talking very minimal before turns to freezing rain, which will also be minimal. However, if enough precip falls it could make bridges/roads icy so be careful in the morning. Most likely just a tree branch / elevated surfaces ice glaze expected. So mainly nuisance type event with temps rising above freezing and therefore erasing any ice by the mid-afternoon if not sooner. Current temps are below 32º now most places or will be per wet bulb temps. Here is the WPC Winter Weather Statement and map concerning the chances of having .25: of ice or greater - not much. Only expect .1-.2" freezing rain overnight and tomorrow morning mainly. Finally, the NWS Advisory Text if you click to read more. Out here. Be safe. WILL CHANGE TO RAIN DURING THE AFTERNOON. EIGHTH OF AN INCH OF ICE GLAZE. * IMPACTS...HAZARDOUS TRAVEL CONDITIONS DUE TO SLICK ROADWAYS. ISOLATED POWER OUTAGES DUE TO DOWNED TREES OR POWER LINES. * TEMPERATURES...LOWS IN THE MID 20S TO AROUND 30. * WINDS...EAST 5 MPH OR LESS.